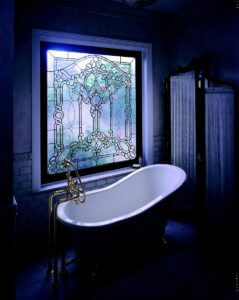 Stained Glass Overlay is one of the leading stained glass manufacturers in the Tri-State area. We specialize in creating artistic beveled, etched, and stained glass images with appealing and original designs. In addition to decorative art glass we offer mirror transformations with custom mirror frames, along with tableaux iron art, dream walls, entry doors, glass counter tops, back splashes, and Tiffany lighting. Come to us for you complete exterior and interior door needs as well, we offer wood and fiber glass varieties. We specialize in working with new home buyers, residential and commercial contractors, interior designers, and more. Our friendly and approachable service is second to none. Family owned and operated since 1985, we have years of experience creating a myriad of home design products. Our design options not only beautify your home or commercial space, but it personalizes and makes it your own at an affordable price. To receive a free estimate or to learn more about our design service, contact us today! Offering unlimited design freedom at almost every price range. We are the area’s only full service art glass manufacturer. 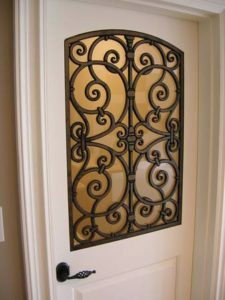 From leaded glass to iron art, we offer a huge selection of home design products customized to fit your needs. We’re here to help you to create a new look for your home or office. From simple to dramatic. Visit our design partners below for more ideas! From your home’s skylights, entryways, even your living room or bedroom windows, we can create customized designs that will not only fit the architecture of your home, but your lifestyle as well! Dress up existing mirrors or add design accents to any wall. From classic to contemporary, our stained and leaded glass craftspeople can create one of a kind panels. When you work with Stained Glass Overlay, you will be proud to display your new home decor with our customized products. Monday – Friday: 10:00 a.m. to 5:00 p.m.
and the Better Business Bureau.